Berlin, Dec 7 (IANS) German Chancellor Angela Merkel gave an emotional farewell speech to her ruling Christian Democrats (CDU) as she stepped down as party leader on Friday and was given a standing ovation of over six minutes. Her conservative party of 1,001 representatives, among them 658 male and 343 females, was set to vote later in the day to decide on a successor to Merkel, its leader of 18 years. She decided not to rerun in October, after suffering major setbacks in two state elections earlier this year. Merkel hinted that she was supporting the party's current General Secretary, Annegret Kramp-Karrenbauer, to succeed her, praising her electoral performance as Chief Minister of Saarland, the BBC reported. According to a DeutschlandTrend survey, 47 per cent of CDU supporters would like Kramp-Karrenbauer to take the party lead. Popular in Saarland and Berlin, Kramp-Karrenbauer has an unpretentious style and a reputation for calm analysis as well as political acumen. Kramp-Karrenbauer's key rival is millionaire corporate lawyer Friedrich Merz. He was a powerful player in the CDU in the early 2000s but left politics when he fell out with the Chancellor. Merz has strong links to the US, has built a career in the private sector and works for US investment firm Blackrock. Jens Spahn, currently the Health Minister in Merkel's government and the third candidate in the running, appeared to have less chance of winning, the BBC reported. He was once described by former Finance Minister Wolfgang SchÃ¤uble as "one of the great hopes for the future of our party". "Our liberal values must be defended, internally and externally," Merkel said in her speech that was punctuated by applause and she got a standing ovation of more than six minutes at the end. She warned of tough challenges ahead, including climate change, maintaining European unity and coping with Brexit. The leader reminded the CDU of other electoral successes in 2017 and avoided mentioning this year's setbacks in state elections. "I don't need to be party chairman to remain bound to this party. And I'm still chancellor," said Merkel, who has been CDU chair since 2000 and was elected Chancellor in 2005. She was re-elected in 2009, 2013 and 2018. Whoever gets elected, the new party chair would face a number of tricky challenges, including finding the right way to cooperate with Merkel, coordinating party strategies and government policies, and coping with the other two governing parties -- the Christian Social Union and the Social Democratic Party. 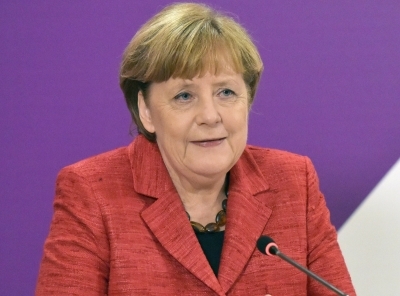 The DeutschlandTrend survey showed that a majority of Germans, 57 per cent, wanted Merkel to remain Chancellor until the next federal election.